Water Testing – The PLIA conducts a regular volunteer-driven water sampling program to assist the NH Department of Environmental Services in evaluating the quality of public waterways. 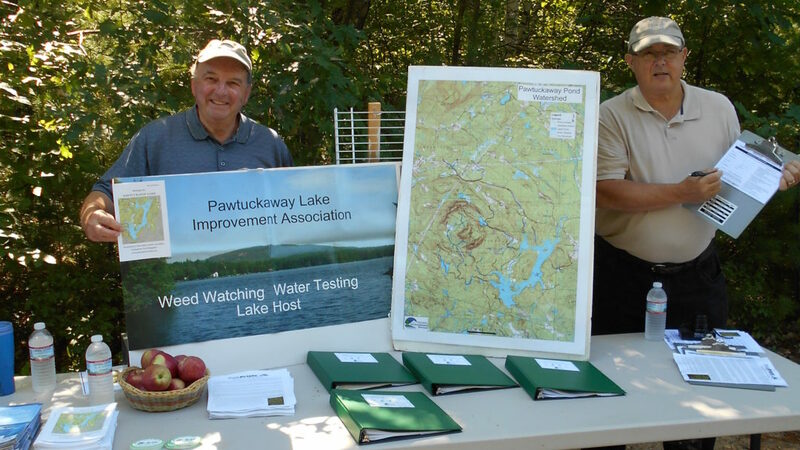 The Volunteer Lake Assessment Program (VLAP) on Pawtuckaway operates through its Water Testing Committee five months a year. Preventing Invasive Species – The Lake Host™ Program is a courtesy boat inspection and public education program to prevent the introduction and spread of exotic aquatic invasive species. Administered by the NH Lakes Association, PLIA volunteers and trained personnel seek to identify and remove foreign “hitchhikers” before they enter the waters of Pawtuckaway and proliferate. Weed Watchers – Trained by biologists, this group has donated countless hours locating and eradicating invasive weeds on this public water body. Volunteers who live or vacation or camp on the lake pitch in to keep biodiversity in balance on Pawtuckaway. Welcome Booklet – The PLIA has created a Welcome Booklet that is a resource guide for anyone who enjoys the beauty and recreational opportunities that Pawtuckaway Lake offers. Partnership Agreement with NHDES – The PLIA works collaboratively with the NH Department of Environmental Services to enhance the lake’s water quality. Through this Agreement, the collaboration continues year ’round, with meetings and reports keeping everyone updated and informed. Road and Island Cleanup – Every spring and fall, PLIA volunteers convene to pick up trash along Route 156; in the fall after the lake level has lowered sufficiently, volunteers perform similar tasks on and around the lake’s many islands. Boat Parade – On the Fourth of July, the PLIA sponsors a parade of decorated boats that makes a lively and colorful circuit around the lake to kick off our country’s birthday celebration.